Tie backs are loops or bands of fabric that hold curtain or drapery panels back from the center of the window. You can make curtain tie backs with matching or coordinating fabric to custom window coverings. Most tie backs are 1 to 4 inches wide, but the lengths of the tie backs depend of the amount of curtain being pulled to the side. So it best to have the curtains sewn and installed before making the tie backs. Measure and mark the width of the tie back fabric. Determine the desired width of the tie-back then double it and add 1 inch. For instance, to make a 4 inch tie back, you would multiply 4 by 2 then add 1 for 10 inches. Continuing with the example, you would measure 10 inches from the top of the fabric and mark the selvage. Measure the length of the tie back. Take the length of the fabric and add 1 inch. Add interfacing for support. Cut a strip of interfacing that is ½ inch longer and 1 inch wider than the fabric. Center the interfacing on the fabric fusible side down. Fuse interfacing to the fabric. Press the interfacing with a clothes iron according to the manufacturer's directions. Fold the fabric in half lengthwise so that right sides are together. Pin the raw edges together, but reserve a 3 inch gap opening in the center. You will need this gap to turn the fabric inside out once it is stitched. Machine stitch a ½ seam from one end to the opening. Use a backstitch, or a few stitches in reverse to prevent the thread from pulling out. Lift the foot and move the fabric, drawing enough thread to reposition the fabric under the foot on the other side of the opening. Backstitch a few stitches then continue stitch to the end. Lay the curtain tie back fabric flat, centering the seam. Iron press the seam allowance open. Stitch a ½ inch seam across the end of both sides. Use a backstitch at the beginning and end of each seam. Turn the fabric right side out by inserting tweezers and pulling the material through the opening. Secure a pin-on tie back ring to the fabric on each end. Make sure 1 hook is on the right side and one hook is on the wrong side. Attach the curtain tie backs to the holder on the wall. Draw the panel to one side of the window with one hand. Hook the ring on the right side of the fabric to the holder and wrap it around the panel then hook the other ring, the one sewn to the wrong side. 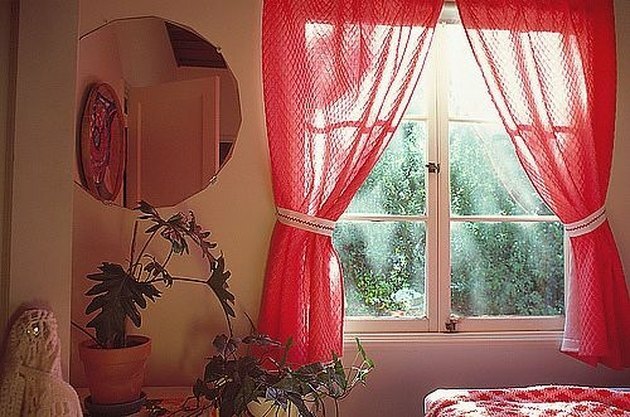 Repeat with a curtain tie back on the opposite side of the window.